These two biotechs have headed in opposite directions this year. Which one is the better choice for new money today? Investing in the biotech industry is risky business. The majority of companies from the sector operate at a loss for years on end in the hope that they will eventually create a blockbuster drug. That formula that works great when everything goes according to plan, but shareholders can be decimated when things don't. Two of the more successful companies in the space are BioMarin Pharmaceuticals (NASDAQ:BMRN) and Sarepta Therapeutics (NASDAQ:SRPT). Both focus on creating drugs to treat rare diseases, and each is poised for strong growth in the years ahead. Let's pit these two against one another to see if we can determine which is the better buy today. BioMarin's long-term investors have enjoyed a great run, but more recently, its shares have been stuck in reverse. That's primarily due to the company's expensive attempt to win FDA approval for Kyndrisa, its candidate to treat the muscle wasting disease Duchenne muscular dystrophy (DMD). Sales of BioMarin's approved treatments continue to hum along. Revenue jumped by 20% last quarter thanks to the strength of hit drugs like Vimizim and Kuvan. That caused management to increase its full-year revenue guidance range to $1.1 billion to $1.15 billion, which represents year-over-year growth of 26% at the midpoint. The company's late-stage pipeline includes two more drugs that it could add to its lineup by the end of next year. The first is Brineura, a candidate treatment for a neurodegenerative disorder called CLN2 disease. Brineura is already in the FDA's hands, and an approval decision is expected by the end of April. The second is pegvaliase, a hopeful treatment for phenylketonuria (PKU). BioMarin plans on having this drug ready for FDA consideration within the next few quarters. 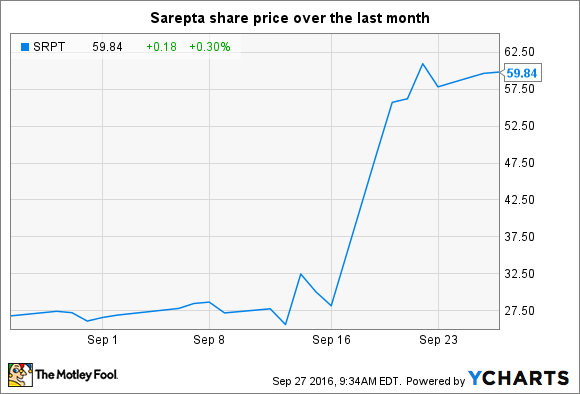 Unlike BioMarin, Sarepta isn't yet producing revenue from product sales, but that's expected to change in the very near future. Earlier this month, the FDA granted accelerated approval to Sarepta's Duchenne muscular dystrophy drug, Exondys 51 (eteplirsen), making it the first and only DMD treatment to reach the market in the U.S. It is estimated that about 13% of patients with DMD have the mutation that fits the drug's labeling, which puts its addressable patient population in the U.S. around 1,400. However, Sarepta has set the annual price of Exondys 51 at roughly $300,000 per year, so if it can capture the majority of that small market, then sales could easily reach into the mid-nine figures. It might even reach blockbuster status if it can go on to win approval in other countries. The only potential wrinkle here is that Exondys 51's approval came with the caveat that Sarepta must conduct follow-on studies that confirm the drug's clinical efficacy. Given the drug's history, that's not exactly a slam dunk, so investors need to be aware that the FDA could later withdraw its approval if it doesn't see evidence that Exondys 51 is effective enough. While I see reasons to be bullish on both of these companies right now, I think BioMarin is the better bet. Its shares are trading at a much more attractive price-to-sales ratio now that they've declined so much, and BioMarin's diversified product portfolio helps to lower the company's risk profile. Sarepta, on the other hand, largely remains a one-drug company -- and that drug also faces the very real risk that it could ultimately be pulled from the market. Thus, while I'm rooting for Exondys 51 to live up to its full potential, the investor in me knows that BioMarin is the better choice for new money today.